Happy Tuesday to everyone, and the week is just beginning, but that’s okay because the week is young and so full of possibilities! In order to survive any week, it is important that people have hobbies and interests that both stimulate the mind and refresh the body and spirit. One very popular way for people to relax is to leave their homes in the city and head for the woods where they either go hunting or fishing. Sometimes, people in the cities can become so obsessed with their hobby that it can take over their life, or in this case, turn into their hobby! 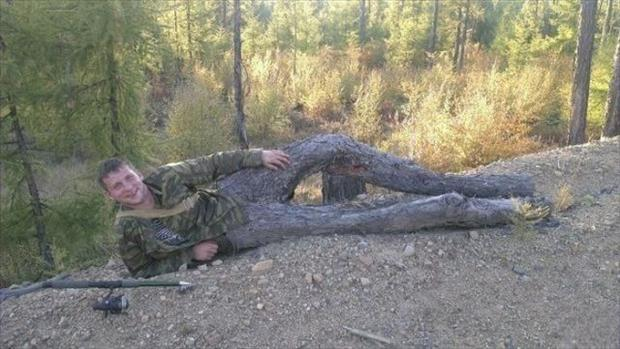 Take today’s optical illusion that involves a man who loves the woods so much he is becoming a tree! It is unclear how this illusion was done, but it does look as if this poor man is becoming a tree from the waist down. Want to see another great body illusion? These are feet that are painted to look like they are wearing shoes, and the artist did a great job because it does not look like paint at all. What do you all think of these great works of art on the feet? Enjoy your Tuesday and we will talk again tomorrow!